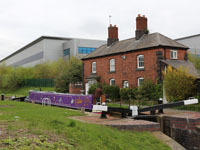 The Tame Valley Canal arrived late, an 1844 equivalent of the M6 Toll Road, built to skirt Birmingham and avoid the congestion of the city centre. The canal is characterised by long straight sections, high embankments, deep cuttings and large road bridges. Subterranean darkness cloaks the first portion of the walk as Spaghetti Junction envelops you in tarmac and concrete pasta. High above, cars and lorries create a concoction of noise and rumble. But even here herons earn an honest living and a graffiti artist takes the opportunity to share some homespun philosophy. However this is the BCN, so practically every surface is spray painted but perhaps not always so eloquently. Thankfully a stone memorial to a murdered policeman has not been defaced, and going under Witton Railway Bridge and the turnover bridge, you leave Spaghetti behind. The chimney on the left of the cut is one of the few remnants of the once mighty GEC. Established in 1912, there were once more employees here than in a small town and the factory's power plant consumed large amounts of coal delivered by canal boat. You pass a lock cottage and Perry Barr Bottom Lock, the first of thirteen over two miles that will take you from 302ft to 408ft. The Brookvale refuse destructor stood on the other side of Brookvale Road Bridge from 1924 until the 60's, served by a small basin at the rear of the works, that was until the M6 barged its way through and the plant was demolished. Passing Witton Cemetery and the rear of the aptly named Safe Harbour pub, known locally as 'the diggers', you're surrounded by huge concrete pillars as you go under the Witton Motorway Viaduct. Next up are the playing fields of Birmingham City University and after Aldridge Road you again fall under the clutches of the motorway. The main flight of Perry Barr Locks are well tended and rather impressive as they climb past the reservoir and Alexander Stadium. There are visitor facilities at the top and after Walsall Road Bridge the rumble of traffic becomes more distant. You could almost be in the country with bluebells amongst the detritus. The towpath is really quite pleasant if a little tedious as the canal is dead straight with high banks, you're essentially in a different world to the surrounding tedious urban sprawl. When the banks suddenly disappear and you cross two aqueducts, a majestic sweep of Hamstead and the skyscrapers of Birmingham City Centre can be 'admired'. You also learn that a local with a can of paint thinks that 'The Revolution Is Now'. Just before Gorse Farm Bridge there was a basin, just about still visible, that served the nearby Hamstead Colliery (1875 - 1965) via a tramway. After Brickfields Turnover Bridge the rumble of traffic becomes louder but there is actually an adjacent field, the first one we've seen since setting off. Eventually Rushall Junction is reached, where the Rushall Canal goes right under a typical BCN bridge. A little further on, extending the walk following the parallel M6, there is another aqueduct from where you can observe the midland motorway network in glorious detail. From Rushall Junction it's probably best to make sure you are on the northern side of the canal as there'll soon be a surfaced towpath to make walking easier. This section is bleak, and that's when the sun is shining, on a damp desolate day you may prefer to be somewhere else. Probably the noisiest part of the BCN, you walk parallel to the M6 with Ray Hall Sewage Works on the other side of a canal that contains the usual varied range of rubbish. A series of windswept aqueducts and narrows take you over the River Tame, M5, the former Grand Junction Railway (which unusually pre-dates the canal) and then Navigation Lane in quick succession. The towpath, straight and uninspiring, continues high above surrounding landscape that was mostly the preserve of sand, gravel and coal pits before large scale housing estates began to arrive between the wars. Along the way the remains of various wharfs and basins can be seen, many had tramways going some distance to pits exploiting the famous 10ft thick South Staffordshire coal seam. After the rather unlovely Walsall Road or Friar Park Bridge you enter a quiet cutting and the canal continues arrow straight with pylons leading the way. The high embankment is strewn with rubbish seemingly thrown over back garden fences from the houses above, a generous amount of dog excrement also makes this one of the BCN's least attractive stretches. After Crankhall Lane Bridge and up to another aqueduct at Hateley Heath, you are above local playing fields but the surrounds are about to change in character after the canal bends at Bull's Head Bridge. Here new housing is soon replaced by rather large, somewhat grim, factories and the local graffiti artists' fascination with satanism is a little disconcerting. Resuming its straight path under the pink Metrolink Bridge, followed by a more traditional Horseley style bridge, the canal reaches Goldhill Stop Railway Bridge. This is naturally covered in spray paint and there's a smell of urine in the air, but this time it isn't human but stemming from horses in a nearby field. However, this isn't a rural idyll as opposite is a rather large electricity sub-station. Over yet another aqueduct and under the Black Country New Road and you reach the Walsall Canal at Tame Valley Junction.